Synopsis (From Goodreads): The conclusion to the phenomenally successful Thirst series follows five-thousand-year-old vampire Alisa Perne as she battles a new race of immortals: the Telar. The Telar are a challenging threat. But Alisa is hungry for blood – and thirsty for revenge. My Thoughts: In 1996, with The Last Vampire: Creatures of Forever, Christopher Pike concluded Sita’s story. In 2010, he showed us all that Sita’s story was not, in fact, over. As if that wasn’t enough, he also promised another book, another extension of the series, a glimpse of something more. In 2011, he delivered on that promise…and Sita’s story, it seems, is concluded once again. Or is it? I feel now just as I felt fifteen years ago as a thirteen year old girl finishing a beloved series. Things are all wrapped up nicely. There’s a pretty bow tied around this beautiful tale and it appears, truly, as if the end has been reached. But I was convinced then that it was the last of the last vampire, and I was proved wrong. I have to say at this point, though I do believe Sita’s tale is fully told, that I hope against hope Mr. Pike is able to continue forward from where Thirst No. 4 ends and that I am wrong again. Thirst No. 4 picks up exactly where Thirst No. 3 left off. There’s clues enough through the book, though, that even if it’s been a year since you read No. 3, you should easily be able to follow everything that’s currently happening. As I said in my review of Thirst No. 3: The Eternal Dawn, I know that not everything Christopher Pike writes is a masterpiece and obviously the man’s writing has some flaws. This book, though, is just fantastic. The pace is spot on – not too fast, not too slow. Like most everything of his that I’ve read, the story grabs you by the neck and yanks you so deep inside its complex web that you’re unable to surface again until the very end when you’re left sputtering and gasping, yearning for just a tiny iota more and yet ultimately feeling satisfied. The Last Vampire series is dark yet beautiful, charged with emotion, gripping, and utterly remarkable. Sita’s story is tragic, fantastic, and magical and I feel honored that Mr. Pike chose to share her life with us. Edited on 9/11/11 to add: Christopher Pike has said that there will be a continuation of Sita’s story. I am beyond thrilled…woot! I LOVED this series when I was a young teen. I will have to read this one. Maybe after a reread of the original books. Which I still have because I refused to part with them. Michelle – I read them as a kid and re-read them when the omnibus versions came out. I absolutely adore the series, and I really hope more folks start reading them again. It’s such a good story! 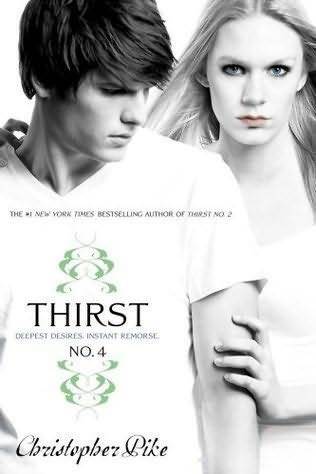 So I’ve read the whole series , and this thirst series is just amazing . i loved this book especially. i would read this whole series again if i wanted too. i hope christopher pike makes another one(; thats how much i love these books.